I snapped the photo as I breakfasted in solitary splendor in the great hall in Christ Church. The reason I had breakfast alone is because I had the time wrong, and when I arrived breakfast was over. With a true sob story about having to take the bus to Heathrow, I asked if I could have a light breakfast of cereal and toast, and the manager was kind enough to allow it. The Rev Richard Haggis was my personal guide around Christ Church College and Oxford, and a splendid guide he was. He should hire himself out. A delicious moment at the great Hall at Christ Church was when I called to Richard's attention that we were cutting the long queue of the hoard of tourists, and he said quite naturally and spontaneously, "This is my place." Not the most inspirational moment, but delicious, and I cherish those small, delicious moments. Nor did I pay the entrance fee, since I was Richard's guest. All quotes below are from Richard. Autumn colors in the vine growing on the wall above a tunnel at Christ Church. The entire walk was lovely. The picture is not photo-shopped but shows the true color of the turning leaves. "The tunnel is to contain an ancient brook which passes under Christ Church and various other parts of the city of Oxford, joining the canal, I believe, a little further north. 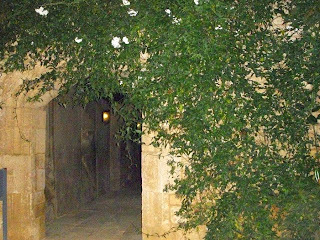 It can be viewed, covered in this splendid creeper, from the walkway through the War Memorial Garden." 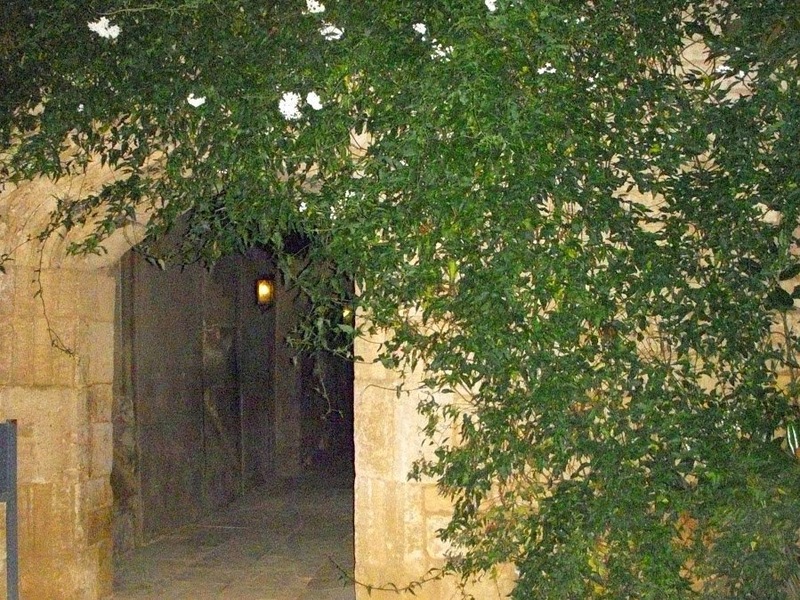 "It is, I believe, creeping jasmine, approaching the south doorway to the historic cloister of S. Frideswide's priory, which Cardinal Wolsey purloined to begin his Oxford college, which Henry VIII later purloined in turn to make Christ Church a college and a diocesan cathedral. It is one of the most ancient parts of the college." The secret garden with the tiny fountain and a lovely weeping willow. The building in the background is the Faculty of Music and the Bate Collection of Musical Instruments. Statue of Mercury in Tom Quad. "'Mercury, beckoning the tourists into Christ Church'. Mercury was initially male, but there was an incident with a firework, and he has been re-assigned. Like Jan Morris, the college's first 'old girl'." Nij, thanks for the tip. I have five of Colin Dexter's mysteries, but I have not read the one you mention. I'll put it on my wishlist. A private breakfast in that lovely old hall, what a treat. Even if it was just cereal and toast. Russ, I thought the same. Thanks for this post. 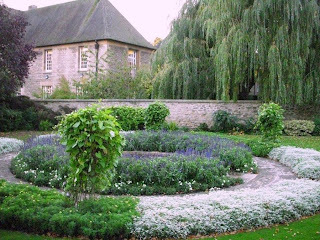 I enjoyed many wonderful walks in and around Christ Church years ago when I visited Oxford during my brother's study there. These photos bring back the memories. I'm not sure I ever saw the secret garden, though. I'm sure much has changed much since my time there, but I loved Oxford. Back in the day, you could freely wander through all of the colleges with nary as much as a sign-in. One of my favorite things was to visit college chapels. Richard gave me the grand tour of Christ Church, including a lovely walk on the path around the meadow. I'd stayed twice at Brasenose College many years ago during study tours, so I was familiar with the Sheldonian, the Camera, St Mary the Virgin, and that area of the university.